From Airbnb: Beautiful home. 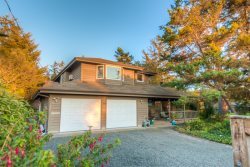 Close to Manzanita beach (awesome beach) and Cannon beach. Jad everything for my teenaged kids and their other halves. My dogs had a great time alao! Will be back! It was perfect. I loved having 2 bathrooms, a washer and dryer, stools around the kitchen island, netflix, a HUGE bed, gorgeous shower, a deck over looking the water, plenty of outlets, closet space, sliding doors in the bedroom, and I loved even the blinds on the windows. The neighborhood and surrounding areas were gorgeous and everything was super accessible and close by. This place was so perfect I had trouble leaving. Honestly, one of the best weeks of my life. I can't wait to return to Manzanita and I will definitely be staying here again.